Oxford Christmas Market will once again take centre stage on the historic Broad Street this year – a stone’s throw from the Bodleian Library, Ashmolean Museum and Radcliffe Camera. 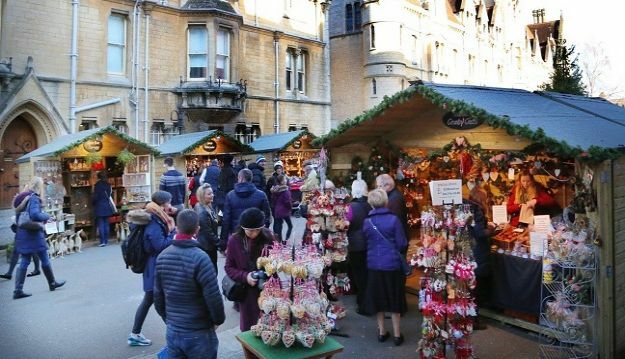 The market, which takes place from 7th to the 7th December, will consist of around 60 festive stalls – all under the stunning backdrop of the dreaming spires of Oxford. There will be stall holders selling natural, handmade decorations and gifts and warming food and drink will include German Bratwurst, Churros with hot chocolate sauce, and traditional Glühwein. Exhibitors include Oxford’s much loved ethical and fair trade shop, Indigo, the award winning liquid deli from Scotland, Demijohn, stylish and original artwork of Oxford by Pitch 26, vintage inspired homeware, gifts and accessories from Laurie & Jules, Kinship of Oxford, The Upton Cheyney Chilli Company, The Fairy Light Company and Oxford Aromatics. Whether you are looking to consume festive drinks and food whilst shopping and enjoying the range of carols and bands playing, or you’re looking for stocking fillers for the foodies in your life, there will be something for all taste buds, many with a European influence. If you’re looking to feast out whilst taking in the festive atmosphere, Soupa Delicious will be serving delicious warming soups served with bred and German Bratwurst will also return offering mouth-watering German Bratwurst, Currywurst and hog roast. For dessert there will be the finest artisan produce from the French patisserie Gatineau Patisserie, sweet and savoury crêpes and Belgian waffles from Crazy Crêpes and Los Churros Amigos will be serving freshly made churros sprinkled with sugar and cinnamon and served with a pot of quality melted Belgian chocolate sauce. And of course, it wouldn’t be a traditional Christmas market without delicious Glühwein (German mulled wine) and warming mulled apple juice from Winter Warmers. For some extra warmth why not add a shot of Amaretto or Rum. For more information and a full list of stalls contact info@oxfordchristmasmarket.co.uk or visit www.oxfordchristmasmarket.co.uk.